I started making water kefir for my family last February and we have since become hooked. This refreshing drink is made by the process of culturing sweetened water with water kefir grains, live bacteria and yeast that eat the sugar and in turn impart a slightly tangy flavor to the drink, while also releasing CO2 to create a fizzy beverage. Oh, and did I mention it is full of probiotics? By flavoring and bottling water kefir, you can create a probiotic-rich, soda-like beverage that’s healthy! 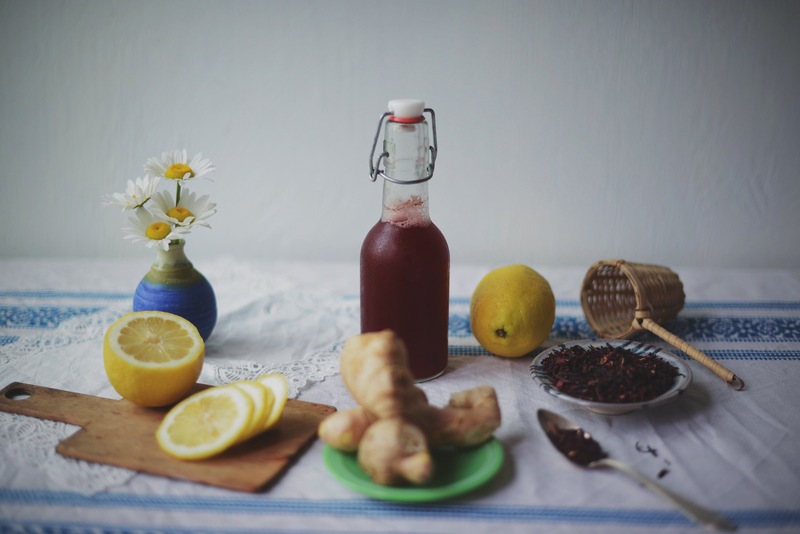 We are currently loving a refreshing hibiscus ginger lemon flavor for summer. Hibiscus has medicinal properties related to maintaining healthy blood pressure and cholesterol levels. 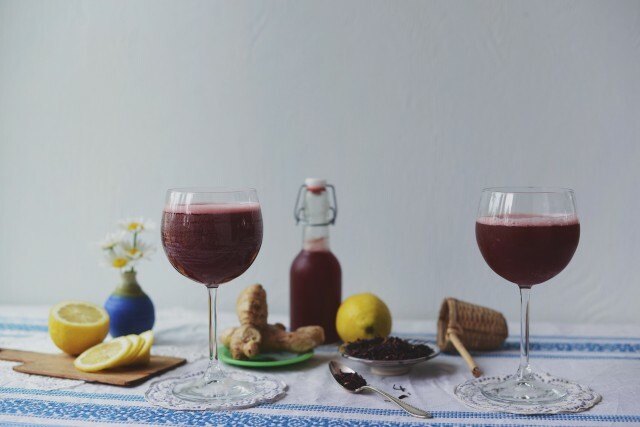 It is used the world over as a refreshing drink, often sweetened, as hibiscus is naturally tart. It is added to many herbal teas blends for its bright red color and health effects. 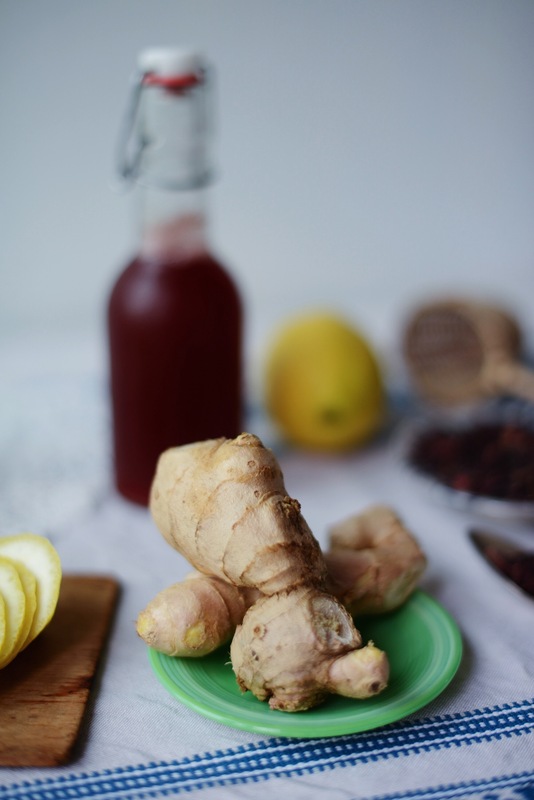 It’s flavor blends wonderfully with that of ginger root and lemon, both of which aid digestion, making this drink super healthy and super tasting. 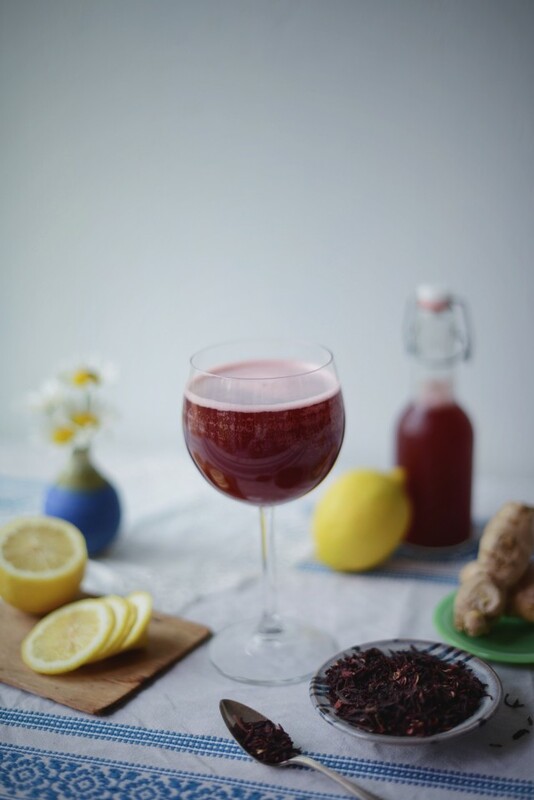 Water kefir is relatively easy to make compared to other fermented beverages, such as kombucha. All you really need to get started are water kefir grains, rapadura sugar, water and a mason jar and cloth. I sourced dehydrated water kefir grains online from Cultures for Health. They take a few days to hydrate and then are ready to start producing kefir. The first culture takes 1-2 days and is ready to drink at that point, or you can flavor, bottle and culture it for 1 more day. You can get creative and flavor it any which way you please. I’ve also shared recipes for citrus flavors and a root beer flavor, which you can search for on my blog. Ingredients: 1 quart water and 1/4 cup rapadura sugar (or sweetener of your choice). Once you’ve sourced and received your water kefir grains, hydrate them in sugar water to activate them. Heat a quart of water to 68˚F-85˚F and pour into a quart sized mason jar. Dissolve rapadura into the water. If temperature of water goes above 85˚F then allow it to cool before adding grains. Add the dehydrated water kefir grains to the sugar water. Cover jar with a coffee filter or cloth and secure with a rubber band. Keep jar in a warm spot to keep temperature between 68˚F and 85˚F for 3-5 days. I keep it next to the stove. After that time the grains will be plump and translucent. Strain off the sugar water and discard. Your grains are now ready to make water kefir. Ingredients: 1 part rapadura sugar to 16 parts water. To make a quart of water kefir use 1/4 cup rapadura to 4 cups water. To make a half-gallon, use 1/2 cup of rapadura to 8 cups water. Heat water to 68˚F-85˚F and pour into a mason jar. Dissolve rapadura into the water. If temperature of water goes above 85˚F then allow it to cool before adding grains. Add the hydrated plump water kefir grains to the sugar water. Cover jar with a coffee filter or cloth and secure with a rubber band. Keep jar in a warm spot to keep temperature between 68˚F and 85˚F for 24-48 hours. The first culture is now complete and you can drink it at this point if you wish. Strain off the kefir grains over a bowl to reserve the water kefir. Prepare a new batch of sugar water and place kefir grains in it to repeat the process and start your next batch. Bring water and ginger to a boil, add hibiscus and lemon, cover pot then remove from heat and allow infusion to steep for 10 minutes. Strain infusion and dissolve rapadura into it. Allow infusion to cool to 65˚F-85˚F. Mix infusion with prepared water kefir. Pour water kefir into clean flip top bottles or a mason jar with a screw band lid. Secure lid tightly. Allow to culture for 12-24 hours. Then chill water kefir in the refrigerator. Open with caution. Bottle water kefir will build up lots of pressure and can spray out when opened for the first time. Keep refrigerated. I strongly suggest using organic rapadura sugar to feed the kefir grains. Rapadura sugar is a traditionally produced whole cane sugar, in which raw cane juice is heated on low low heat to naturally evaporate the water content, and is then poured into brick molds, and hardens when cooled. The sugar bricks are then passed through a sieve to granulate the sugar. The molasses is never separated or removed; therefore the final product retains much of the high mineral content naturally found in sugar cane. Water kefir grains benefit from high mineral content waters. So if you are using distilled or filtered water, the high mineral content of rapadura will replace what has been lost from the waters. Avoid metal utensils, except for stainless steel, when making water kefir. Click here for a source for flip top bottles. Before bottling water kefir, check bottles for cracks. Remember that fermented foods should have a sour but clean smell and taste. Don’t consume anything that tastes bad to you. This entry was posted in E A T and tagged Fare Isle, Kaity Farrell, water, water kefir. I love this post! We are all about cultured foods in our house as well. We are big on making sourdough bread and sauerkraut. And i have been toying the idea of making water kefir for the last year now, but just haven’t gotten started. We don’t use a lot of sugar in our house, is this drink very sweet? I battle with using sugar because I know how detrimental and addictive it can be, and how it is already in almost every single food item you could ever want to buy in a store, unless you are buying fresh foods. So, we pretty much make all our own food these days… It’s hard to go to see friends and family, because we are alone in our view. Hi! I’m on my third batch if this…wonderful, thank you for the recipe and information. However, I can only seem to tolerate 2-4oz. per day. Is it common to drink glasses of kefir a day or at a time, like the ones pictured above? It’s delicious, but my insides just can’t seem to take it. Maybe if I add more water to the hibiscus recipe? Any help is appreciated. I’ve read up on other sites, but thought I’d ask here as well. 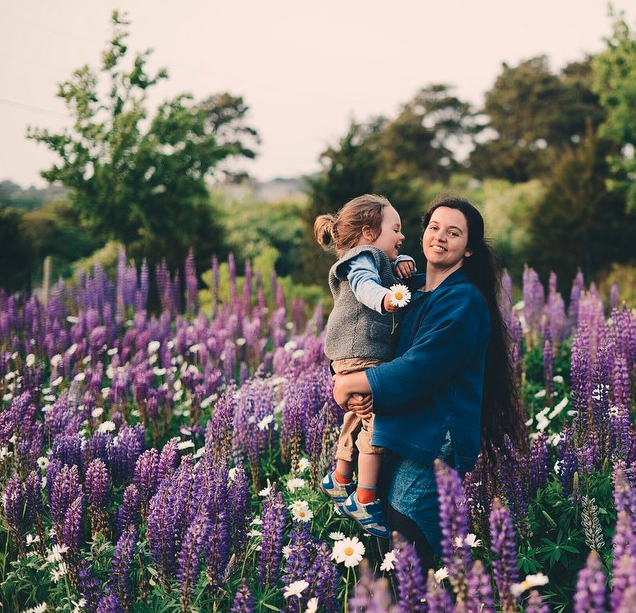 Thank you…beautiful blog. Look I really do not know what to say, as I am not a health professional but I know you should listen to your body. I drink the water Kefir plain, and not every day. I drink a big glass (1 measuring cup) every 2-3 days, when I “feel” like it. Wishing you the best. Thank you. Thank you for your reply…that is helpful. Much peace to you.